“Beating Buffett” Blog is full of B.S. I recently ran across a new blog called “Beating Buffett”. I think Beating Buffett is a great concept, and it’s among my own personal benchmarks as an investor. However, BeatingBuffett.com is definitetly not a great blog and will not go into my bookmarks unless its performance improves significantly. The article then plots a chart of NLY’s stock price, using a cherry-picked time period to show a net loss over 3 years, and totally ignoring the huge dividend payouts from Annaly. In point of fact, a more assessment of NLY vs. the S&P 500 ($SPX) must include the total return of both. 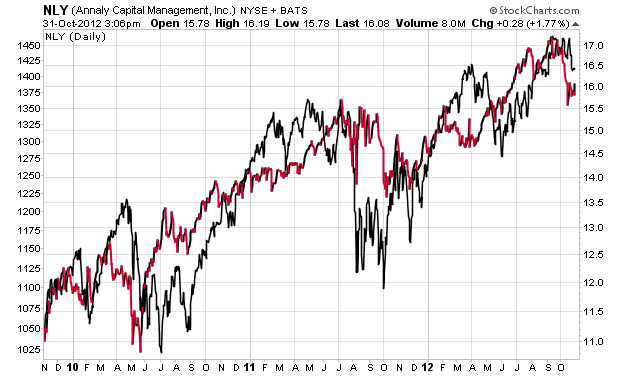 The chart below does this and shows that NLY has held its own and at times done better than the S&P 500. This chart correctly captures the reality that NLY pays out around $0.50/share quarterly, a much higher dividend yield that the S&P 500. Disclaimer: I don’t own NLY directly, though I may have some through a mutual fund, but even I know that to assess an investment over a 3-year horizon what matters is total return, not share price. If you want to “Beat Buffett”, you’d better do so on a total return basis over time, and after taxes! This entry was posted on Wednesday, October 31st, 2012 at 11:10 and is filed under Uncategorized. You can follow any responses to this entry through the RSS 2.0 feed. Both comments and pings are currently closed.